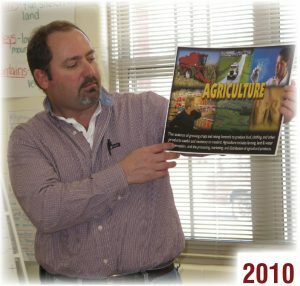 Eric Lawler is simply “amaizing.” For more than two decades he’s been talking about corn in the classroom. Armed with a bushel basket full of corn-related materials and a lesson, Eric Lawler visits elementary schools to help grow young minds and share kernels of knowledge. 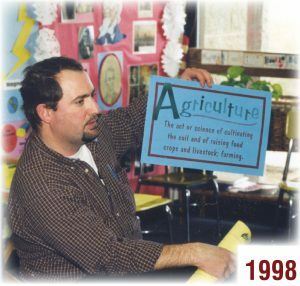 Eric has been an Ag in the Classroom (AITC) volunteer for 22 years. 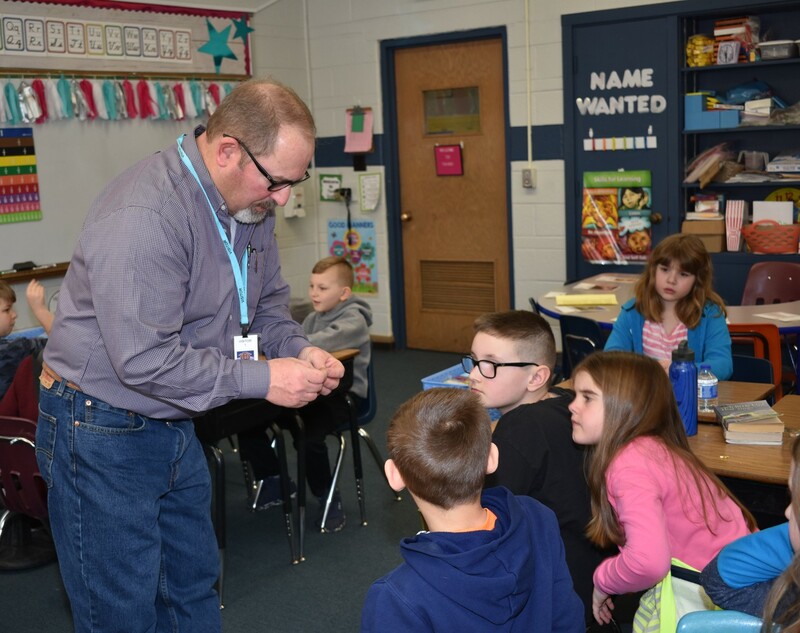 He provides the enthusiasm and farm expertise while DeKalb County Farm Bureau’s Ag Literacy Program equips him with materials for his presentations, primarily the third grade corn lesson. 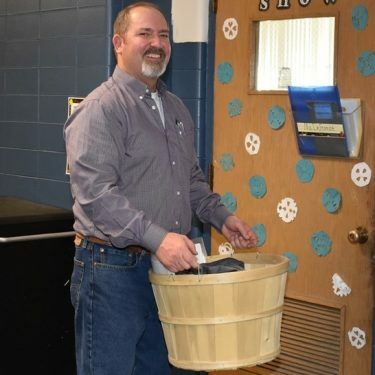 His bushel basket contains ears of corn, pictures of planting and harvesting the field crop, posters of a corn kernel and a corn plant, kernels for dissecting, as well as an interactive exercise which keeps students engaged. He started volunteering for AITC in 1997, with the encouragement of some farm friends. He vividly remembers his first classroom visit: “I was scared to death. I was nervous,” said Eric. In the next and subsequent years, Eric became a “natural” in the classroom, interfacing comfortably with the young children. 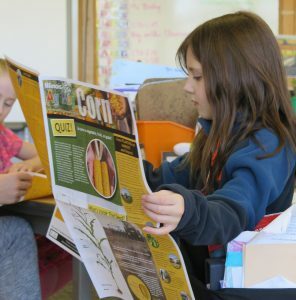 This student learns more from the Illinois Corn Ag Mag given to third grade students during Ag in the Classroom presentations. “I’ve learned that you go with the flow. Every class is different and each presentation evolves,” said Eric. In a recent visit to a third grade classroom one student asked Eric, “Why are you so interested in corn?” “That’s a really good question,” answered Eric. He has been a farm manager for Babson Farms for 32 years. He manages farmland for the Babson family- owned property in north central Illinois. He also works with the farm’s crop insurance and tiling businesses based out of their farm office in rural DeKalb. Babson Farms has always been supportive of him taking time out of his work day to visit local classrooms. Another connection to the classroom for Eric is his family legacy of teachers. His grandmother and mother were elementary school teachers. And his daughter, Allie, aspires to be a high school English teacher. Allie is a senior at DeKalb High School and plans to attend Illinois State University. Eric’s son, Nathan, is a junior at DHS. 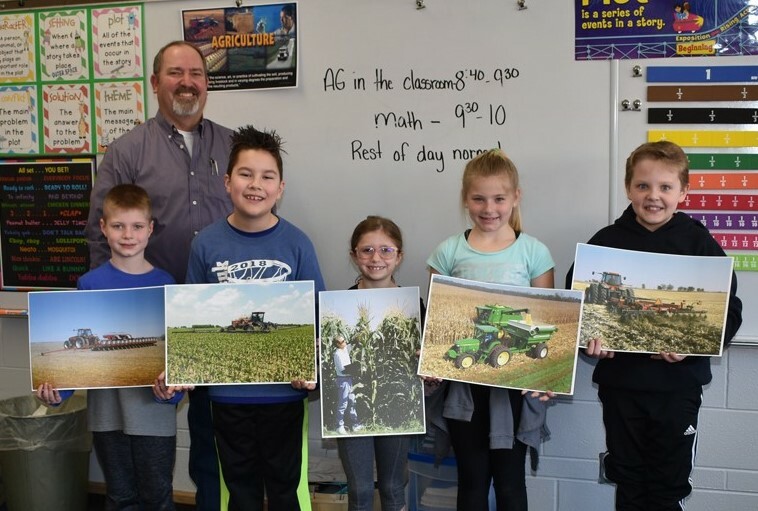 Identifying the sequence of the cycle of field corn, Somonauk students (from left) Conner Adams, Fenix Johnsen, Maya Dalton, Shaynee King, and Spencer Tripp get it right. They are third graders at James R. Wood Elementary, shown with Eric Lawler. 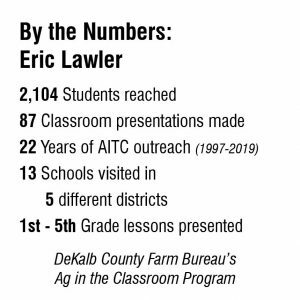 When Eric’s children were in first through fourth grades, he visited their classrooms and presented AITC farm lessons at Brooks Elementary. Otherwise, he’s primarily done the third grade corn lesson at 13 different schools. He typically runs solo as a presenter but notes that Nathan helped him one year while in high school. 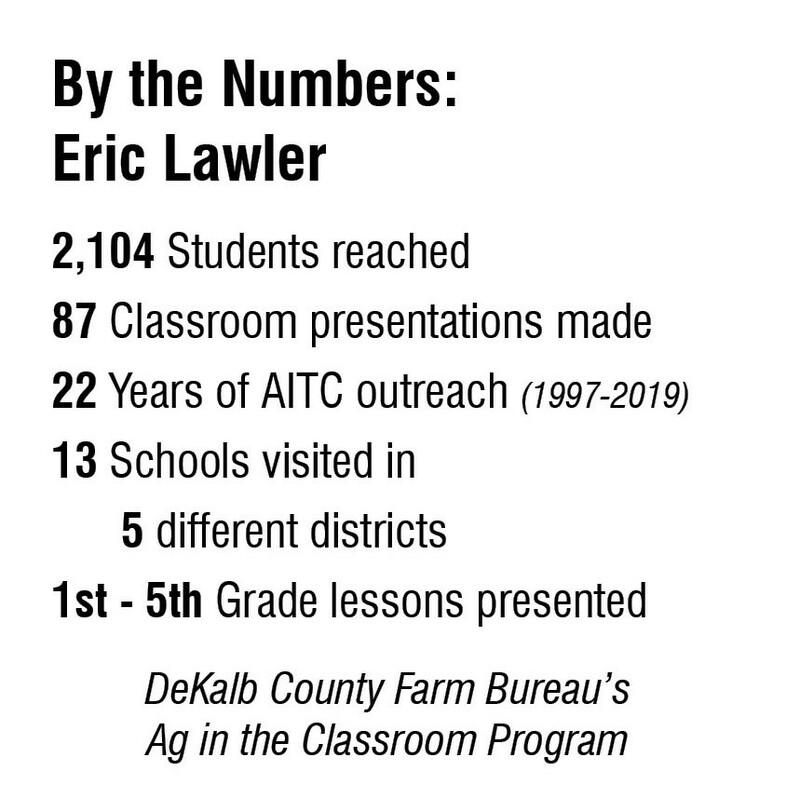 AITC presentations for first through fourth grades are typically conducted in February by about 100 farm and agribusiness volunteers. Other classroom presentations occur in December for fifth grades. In the last eight years Eric has delivered fifth grade agricultural career lessons too. But Eric’s involvement in helping grow young minds doesn’t stop there. 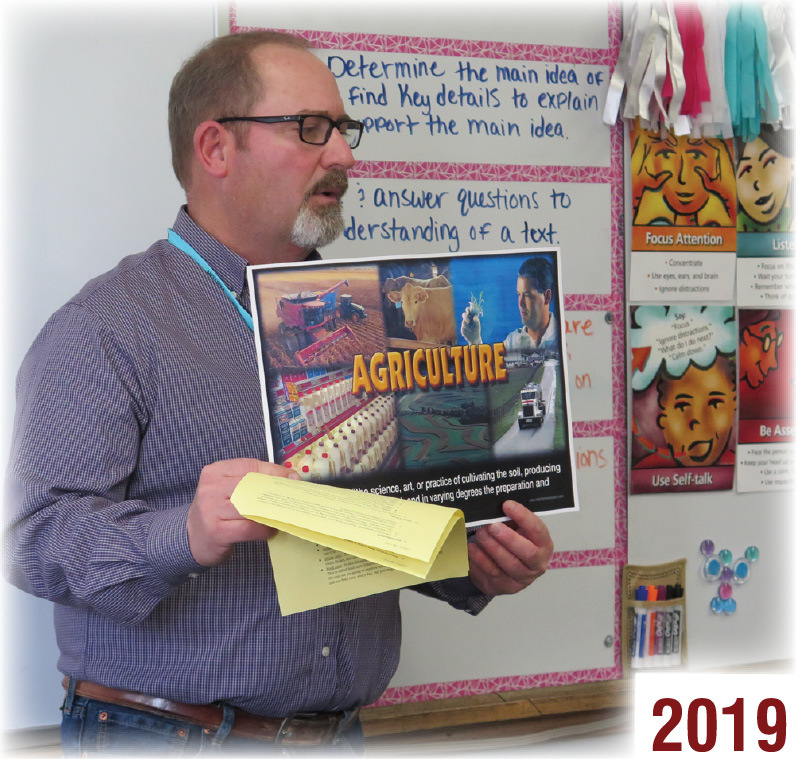 He has volunteered at the Ag History Expo held at Farm Bureau to help DeKalb third grade students understand the history of the maize crop and uses of field corn. He also serves on the AITC Committee. 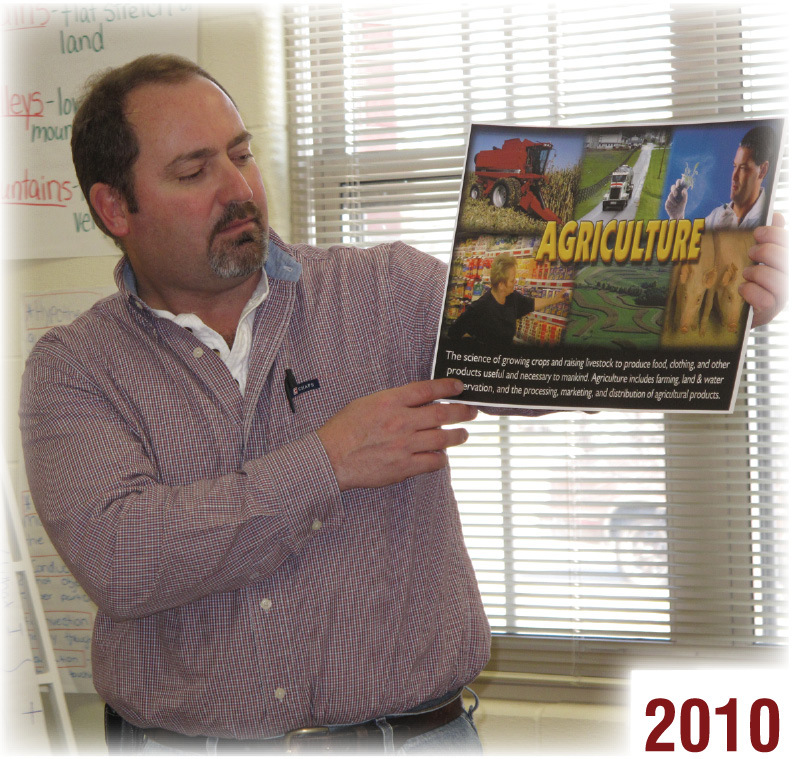 Additionally, Eric is a graduate of the Farm Bureau Agriculture Leaders of Tomorrow program. 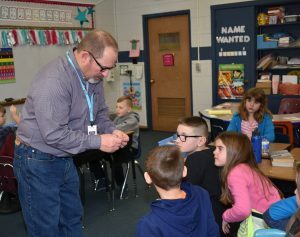 Eric Lawler shows students how to dissect a kernel of corn during a lesson at James R. Wood Elementary in Somonauk. 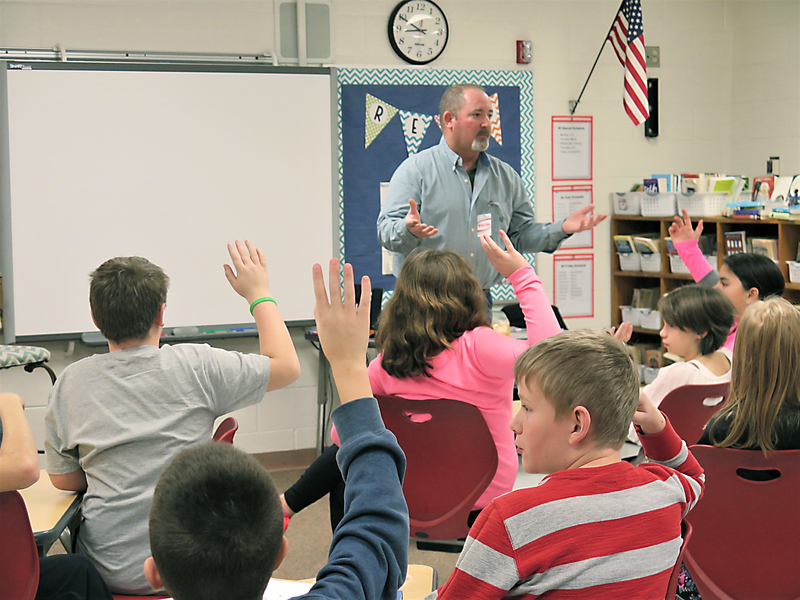 In December, Eric Lawler visited fifth grade classrooms at Southeast Elementary in Sycamore to talk about agricultural careers. 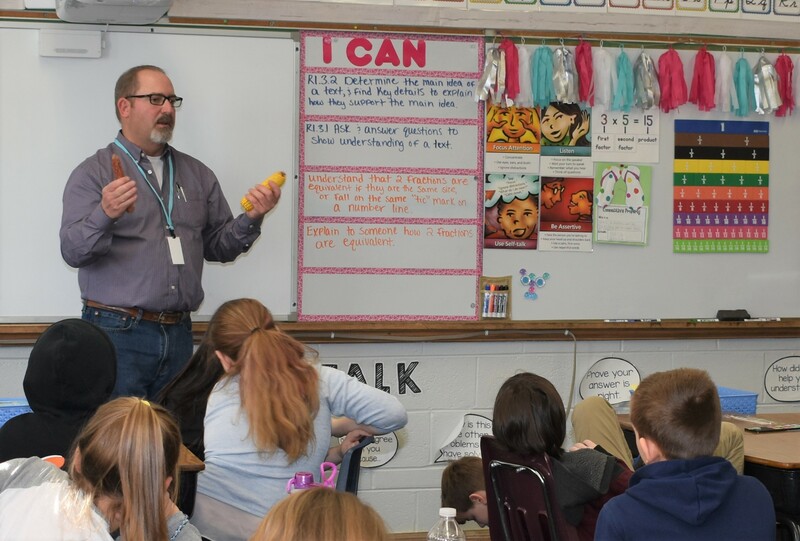 Showing examples of an ear of field corn (and the cob) helps third graders at James R. Wood Elementary understand differences between field corn and sweet corn as part of the “It’s an Earful” lesson.